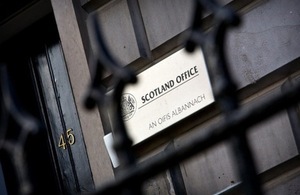 The Advocate General said that any attempt by the Scottish Government to proceed with a referendum which is outside the Rule of Law would be "a very worrying step for a democratically elected government to take"
Lord Wallace of Tankerness QC, the Advocate General for Scotland, has today said the Scottish Government’s forthcoming consultation paper cannot conceivably produce a solution to the legal problem which prevents Holyrood holding an independence referendum. Lord Wallace reiterated the UK Government’s legal view that the Scottish Parliament has no power to legislate for a referendum on independence and said it would make a great deal of sense for the First Minister and the Scottish Secretary to meet so that they can clear the path to a legal, fair and decisive referendum for the Scottish people. The Advocate General said that any attempt by the Scottish Government to proceed with a referendum which is outside the Rule of Law would be “a very worrying step for a democratically elected government to take”. Lord Wallace will give a lecture at Glasgow University on 20 January on Scotland’s constitutional future. Speaking ahead of that lecture Lord Wallace commented on the UK Government’s plans to facilitate a referendum on Scottish independence. “Let me be clear. The Government wishes the referendum to take place on a sound legal basis, thus avoiding court challenge. The Government has therefore proposed a solution that involves devolving power to the Scottish Parliament that would avoid a referendum bill being dragged through the courts. It would make a great deal of sense for the First Minister and the Scottish Secretary to meet so that they can start clearing the path to a legal, fair and decisive referendum for the Scottish people. There is no reason to delay these talks while we await the Scottish Government’s own consultation paper because there is nothing that could conceivably be in that document that will alter the legal position we face. “The UK Government’s legal view is that the Scottish Parliament has no power to deliver a referendum on independence. It does not matter whether such a referendum is described as “advisory”, “consultative” or providing a basis for negotiations. The Scottish Parliament has no power to legislate for a referendum on independence. “There are important consequences which follow from this. One is that to proceed with a referendum that is outside of its legal powers would be to act contrary to the Rule of Law. This is not a mere legal technicality as some commentators have suggested. Government according to law is a fundamental principle of democracy. To flout this principle would be a very worrying step for a democratically elected government to take. “The second is that Scottish Parliament legislation paving the way for an unlawful referendum would be open to challenge in the courts. That challenge could be initiated in the Court of Session by any individual or organisation with sufficient interest to bring proceedings. It is important to note that a successful challenge in the courts could not only invalidate the outcome of the referendum - it could stop the referendum happening in the first place. “The UK Government acknowledges the political mandate achieved by the SNP at the May 2011 election. It is precisely because of this political mandate that the UK Government is offering means to ensure that the Scottish Parliament has the power to deliver a referendum that is fair, legal and decisive. The Section 30 order included in the Government’s consultation paper would achieve this, and we are consulting in order to take the views of others on the issue.